In a real shocker, Statistics Canada announced this morning that employment dropped by 51,600, retracing most of the 54,100 gain in July. Economists had been expecting a much stronger number, but the Labour Force Survey is notoriously volatile, and job gains continue to average 14,000 per month over the past year. Full-time employment growth has run at about twice the pace at an average monthly increase of 27,000. Labour markets remain very tight across the country. The unemployment rate returned to its June level of 6.0%, ticking up from 5.8% in July. July’s jobless figure matched a more than four-decade low. At 6.0%, the unemployment rate is 0.2 percentage points below the level one year ago. All of the job loss last month was in part-time work, down 92,000, while full-time employment rose by 40,400. The strength in full-time jobs is a sign that the labour market is stronger than the headline numbers for August suggest. On a year-over-year basis, employment grew by 172,000 or 0.9%. Full-time employment increased (+326,000 or +2.2%), while the number of people working part-time declined (-154,000 or -4.3%). Over the same period, total hours worked were up 1.6%. Statistics Canada commented that monthly shifts in part-time employment could result from movements between part-time and full-time work, the flux of younger and older workers in and out of the labour force, changes in employment in industries where part-time work is relatively common, or deviations from typical seasonal patterns. By industry, the decline was broadly based and included a loss of 16,400 jobs in construction and 22,100 in the professional services sector. The number of people working in wholesale and retail trade declined by 20,000, driven by Quebec and Ontario. Job losses were huge in Ontario as employment increased in Alberta and Manitoba. Employment was little changed in the other provinces. After two consecutive monthly increases, employment in Ontario fell by 80,000 in August, which was the province’s most significant job loss since 2009. All of the decline was in part-time work. On a year-over-year basis, Ontario employment increased by 79,000 (+1.1%). The Ontario unemployment rate rose 0.3 percentage points in August, to 5.7% (see table below). In Ontario, full-time employment held steady compared with the previous month, with year-over-year gains totalling 172,000 (+3.0%). Part-time jobs fell by 80,000 in August, following a roughly equivalent rise in July. In the 12 months to August, part-time work decreased by 93,000 (-6.7%). Employment in Alberta rose by 16,000, and the unemployment rate remained at 6.7% as more people participated in the labour market. Compared with August 2017, employment grew by 53,000 (+2.3%), mostly in full-time work. In Manitoba, employment rose by 2,600, driven by gains in part-time work, and the unemployment rate was 5.8%. 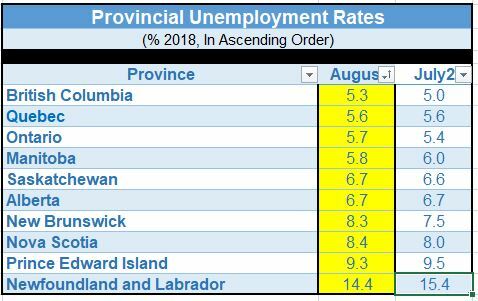 On a year-over-year basis, employment in the province was unchanged, while the unemployment rate increased 0.8 percentage points as more people looked for work. In British Columbia, employment edged up and the unemployment rate increased 0.3 percentage points to 5.3% as more people searched for work. Compared with a year earlier, employment was virtually unchanged. 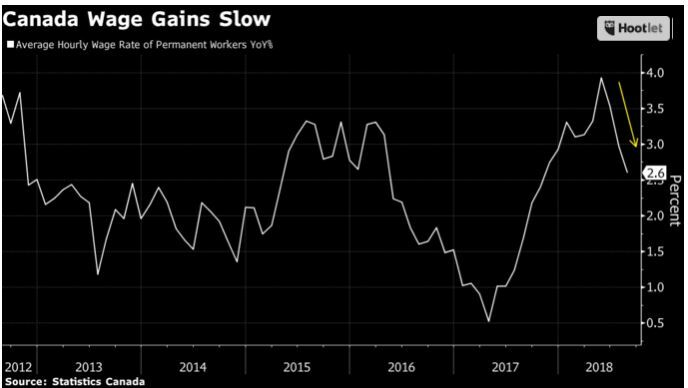 Wage gains decelerated to their lowest level this year as average hourly earnings were up 2.9% y/y, the slowest pace since December. There is no real urgency for the Bank of Canada to hike interest rates as the economy shows little risk of overheating. So far in 2018, the economy has shed 14,600 jobs, but the number masks a 97,300 gain in full-time work. Part-time employment is down by 111,900 this year. The economy is running at or near full-employment as job vacancies continue to mount. If a NAFTA agreement comes to fruition, it is still likely the Bank of Canada will raise interest rates once again at the policy meeting in October. The Bank of Canada guided in that direction yesterday when Senior Deputy Governor Carolyn Wilkins said the central bank’s top officials debated this week whether to accelerate the pace of potential interest rate hikes, before finally choosing to stick to their current “gradual” path.